Harper Collins, the publishers that brought us Harry Potter Page to Screen: The Complete Filmmaking Journey, Harry Potter Film Wizardry, and, of course, the Collector’s Edition of Page to Screen (which includes eight tomes and comes in a collectible case), will publish Harry Potter: The Creature Vault on October 28, 2014. Dementors and [h]ouse-elves, merpeople and Chinese Fireball [d]ragons—these are just a few of the magical creatures and frightening monsters populating J. K. Rowling’s wizarding world. 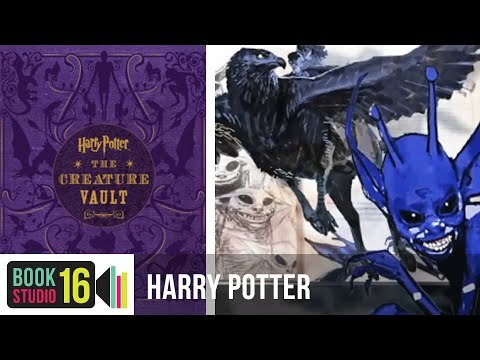 Harry Potter: The Creature Vault is a fascinating look at how this menagerie was brought to life for the blockbuster Harry Potter film series. Detailed profiles of each creature include rare concept illustrations, behind-the-scenes photography, and filmmaking secrets from the Warner Bros. archive. A removable poster picturing each of the creatures and an interactive Eeylops Owl Emporium catalog complete this must-have package. What’s more, according to our friend Cory at French Harry Potter fansite La Gazette du Sorcier, the publishing house is set to release two additional volumes in 2015, one about the characters in the films and one about spells. We have no other information about these volumes at this time, but we’ll be sure to let you know when we do. It should be noted that the title of The Creature Vault is very similar to one of those included in the collector’s edition of Page to Screen – The Creature Shop Compendium: Flora and Fauna from the Harry Potter Films – but it is unknown how similar the content of the two books will be. Little else is known about the book’s release at this time, but if you own any of Harper’s previous Potter publications, you know that this is sure to be a beautiful book! And at $45.00, it comes with a much more reasonable price tag than their last publication! Click on the picture, scroll down and you'll be able to see some of the content...hopefully the new book will be just as cool.